Mourners gathered in memory of Danielle Allen a year after she was killed in a car accident. Credit: Matt Skoufalos. Danielle Allen was killed in a two-car accident in Oaklyn last year, a month-and-a-half away from her wedding day. Her fiancee, Mike Niessen, revisited the scene of the crash for the first time Saturday. 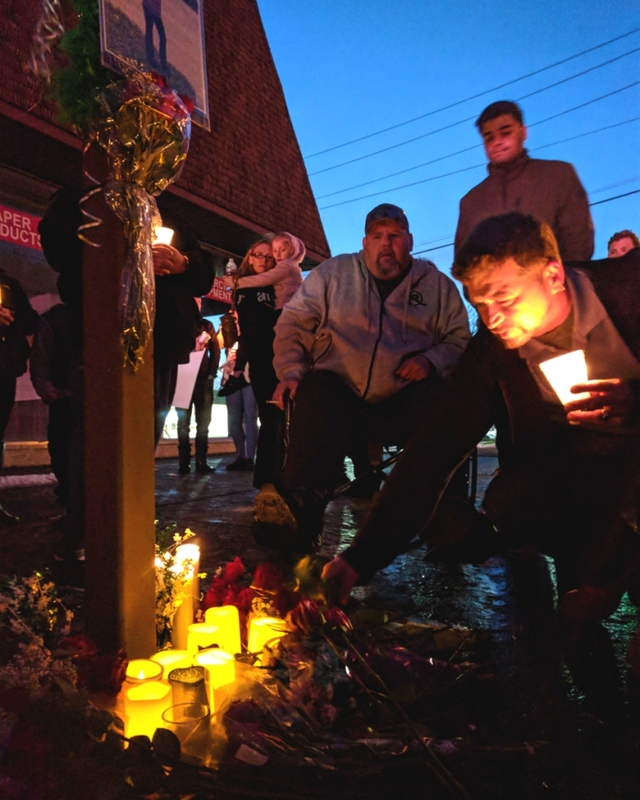 Chris DePietropolo (right) places roses at a vigil for his sister-in-law, Danielle Allen, while her fiancee, Mike Niessen, looks on from a wheelchair. Credit: Matt Skoufalos. For the past year, Mike Niessen has avoided traveling the White Horse Pike from Oaklyn into Audubon. “We’ve gone miles out of our way,” just to avoid the intersection at Capitol Avenue, Niessen said; an extra chore for a Collingswood resident who has close family in Audubon. It was a year ago Saturday that Niessen and his fiancée, Danielle Allen, were struck there, head-on, by an SUV that drifted into the path of their truck. Allen was killed in the crash, as was 28-year-old Chaquana Little of Lindenwold. Little’s mother, Charmaine Jackson-Little, was hospitalized, as was her 17-year-old sister. Niessen awoke to the news that Allen had been killed in the accident, that her funeral had already taken place, and that he would be facing a lengthy recovery before he could walk again. He’ll have his 17th surgery later this week. On Saturday, Niessen revisited the scene of the accident to hold a vigil for his departed fiancée. At first, he couldn’t even bring himself to get out of the car. “The hardest thing for me was not being able to say goodbye,” he said. The couple had been a month out from their wedding day when Allen was killed. 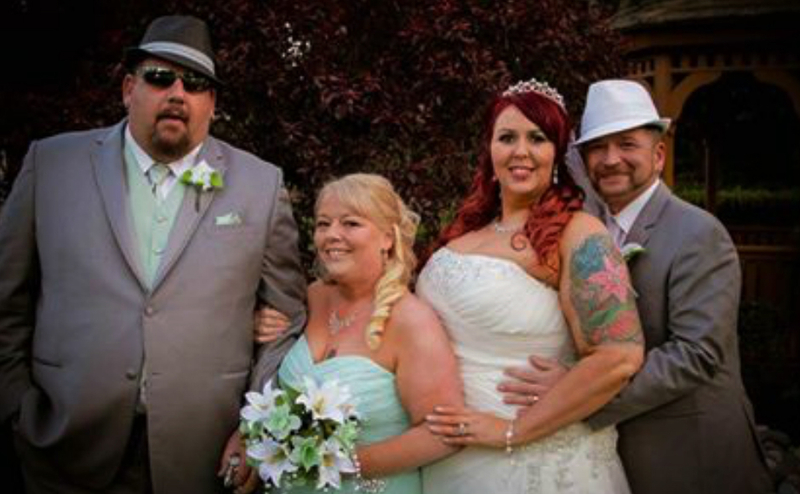 With five children between them, they were making their long-term relationship official. 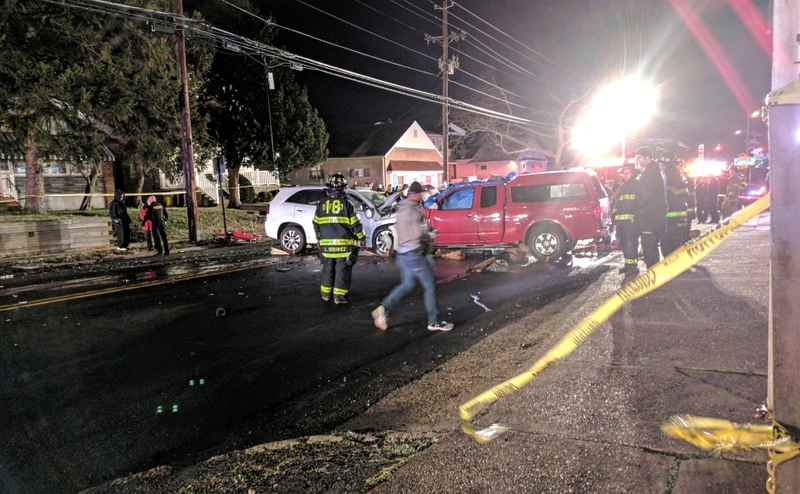 Danielle Allen and Chaquana Little were killed in a multi-vehicle accident on the White Horse Pike in Oaklyn. Credit: Matt Skoufalos. Niessen is still putting the pieces of that night back together in more ways than one. Memories come back to him in snatches, usually after a night of deep sleep. Sometimes family members can confirm stray details that resurface. It’s difficult to manage sometimes. “He’s having it rough,” said Mike’s mother, Barbara Niessen. “She brought out the best in me,” Mike Niessen agreed. “She was too stubborn to give up. 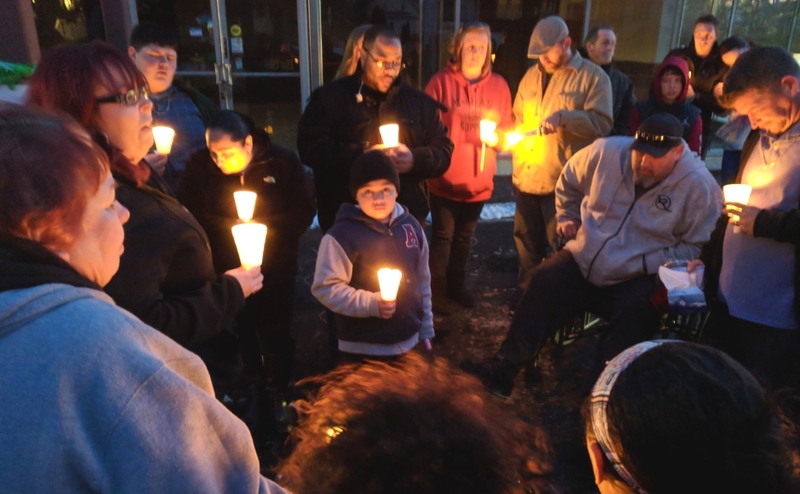 Loved ones lit candles and placed roses at the foot of a post outside the shuttered Camden Bar & Restaurant Supplies building. A bunch of star-shaped balloons—teal and black for her wedding colors, silver for Allen, and white for Niessen—flapped in the chill. 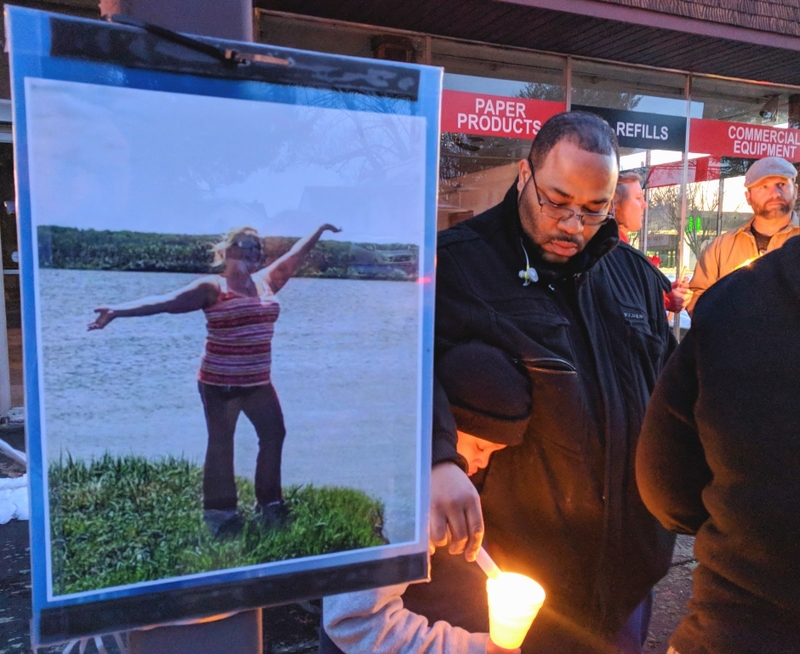 Friends and family mourn Danielle Allen at a roadside vigil in Oaklyn. Credit: Matt Skoufalos. “God took the most precious person out of all of our lives,” said Niessen’s sister, Carol Niessen DePietropolo. Allen was well-remembered as the friend you could count on to sneak you snacks in the hospital; to go out dancing and feel carefree. She had a perfect macaroni-and-cheese recipe. Her coworkers at Great Clips Audubon Crossings keep her memory alive with a small plaque. Friends and family were all as one in her eyes, said Allen’s brother-in-law, Chris DePietropolo. “Whether you are or you aren’t, everybody’s family,” he said. Mike Niessen and Danielle Allen (left) and Carol Niessen DePietropolo and Chris DePietropolo. Credit: Carol Niessen DePietropolo. Allen would have been touched by the kindness, Mike Nieesen said. “I know she’s here right now, appreciating this,” he said. “She’s watching you til the day you die,” Barbara Niessen said.